[ WARNING! ] Please use these electronic resources for individual, noncommercial use, without systematically downloading. Please read "Copyright and Fair Use" and observe the rule. [ To everyone connected to "VPN service" of ICTS ] If you access database from outside the university, please access from the previous this page. *Only titles approved by the publisher are available. This Proxy Service uses the SSL digital certificate issued by DigiCert. Have a Nagoya University ID and password to get access to this service. Ensure that the service needed is included in the list on the right side of this page. The services on the list are provided to the University members by the providers for off campus access. Access to other services is limited to on campus use. Click the name of the service in the list. You will be asked to enter an ID and password. Access to the service will be granted after identification is accepted. If no screen transition is observed, try reloading (e.g. clicking 'Reload current page' or 'Refresh') on that page. Access to such services from outside the University is available only through this start page. Click Log out found on the upper left side of this page. Click Log out of CAS(Central Authentication Service). Users must log out of both the proxy service and CAS for a complete logout. When the window is closed without logging out, it is possible to log out by accessing this page on a new window. When the service is left unused for 120 minutes, you will be logged out of the proxy service automatically. 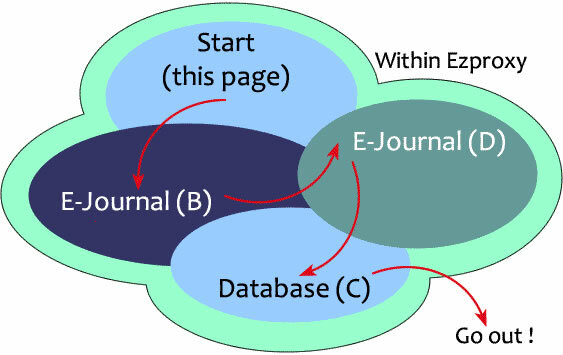 While logging into the services, users will fall outside the range of the proxy service when electronic journal sites are accessed directly from a bookmark such as Favorites. Be sure to follow links from this page. If you jump from this page to a website not supported by the proxy service you will also go out of the range of the service. Users should understand that the proxy service is only accessible within the range of its supporting sites. the user is within the range of the proxy. If 'ejgw.nul.nagoya-u.ac.jp' is not in the address, the user is outside of the range of the proxy. Messages such as 'Unauthorized to use the site' may appear on the monitor. The following diagram shows the image of within and outside of range. Software called EzProxy is used, whose name appears in the diagram. When realizing that you have gone out of range of the service, return to this page and follow links to the necessary page, which is accessible without logging in. What is "Nagoya University ID"? The database I use regularly is not on the list. What should I do? I closed the window without logging out of the proxy service connection. What should I do? When I try to access a database, the message 'There is a problem with this website's security certificate' appears on the monitor. What is wrong? When I open the index (in a PDF format) of an article to jump to the article I want, I go out of range of the EzProxy service. How can I read the article? I am a professor emeritus. Can I use electronic journals off campus? What procedures should I follow? Any current member of Nagoya University may use this service. It is not available to alumni or retirees. Members of Nagoya University consist of professors emeritus and current faculty and students. Nagoya University ID is given to every member of Nagoya University and may be used as a lifelong ID. Graduate and undergraduate students are given their ID by the registrar in print at enrollment, and faculty is also notified in print. Other students and researchers who have applied for an ID may use it. This service consists of databases, electronic journals, and electronic books which the off-campus use is approved by the contracted providers. Electronic services not listed should be used on campus. The message appears if the link URL starts with 'https://'. This happens when the database site is not considered safe. The URLs on the list link to the right page. Approve the irregularity of the security credential to access the database by the following procedure. The message 'There is a problem with this website's security certificate' appears. The message 'This Connection is Untrusted' appears. » Click 'Confirm Security Exception' button in the pop-up window. When the window is closed without logging out, it is possible to log out by accessing this page on a new window. When the service is left unused for 120 minutes, you will be logged out of the proxy service automatically. For security purposes, do not forget to log out. If you jump via PDF files, you will go outside the range of the Proxy service. Always choose a HTML format to jump through the index page to the links needed. A professor emeritus can get access to this service with Nagoya University ID from May, 2008. *The former ID (Dedicated ID for remote access) is expired March 31, 2009. Nagoya University ID is informed by submitting 'Nagoya University ID Application' to the front desk at Information Technology Center of the Information and Communications Headquarters on the first floor (Tel.:052-789-4354). After you get Nagoya University ID, please follow the starting procedure. *Application forms, documents required, etc. Attention : If you have Nagoya University ID issued before May 2008, you may not log in with your ID. In that case, you need to submit 'Nagoya University ID Application' again. Please contact the front desk at Information Technology Center of the Information and Communications Headquarters.